Good morning crafters! I am really excited about today’s post! This week, two of my favourite companies are teaming up for some Christmas crafting fun, and today is one of my days to share a little project with you! Every Christmas for the last three years or so, I have gone on a bit of a chocolate bar wrapper kick! 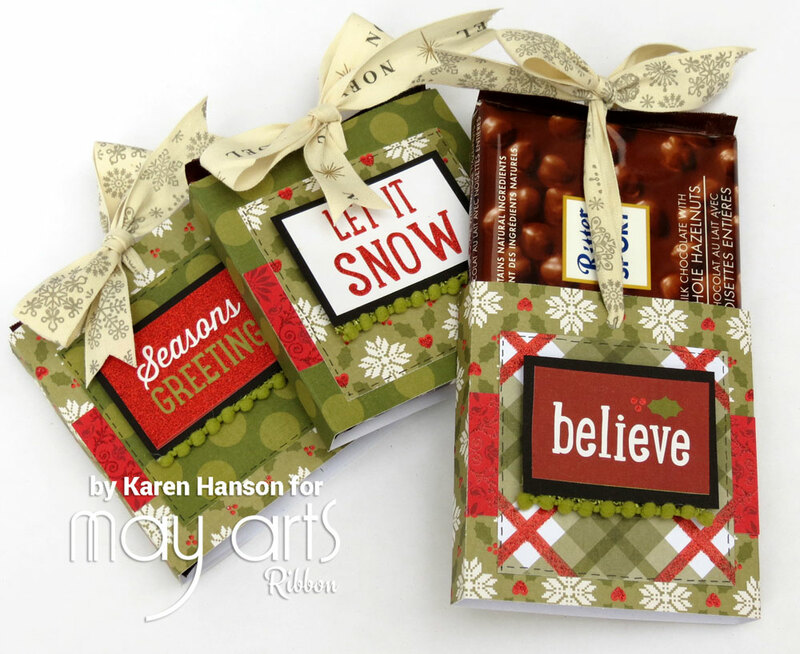 I love making these little wrappers – not only do they serve as greeting card, but they have a yummy treat inside for the recipient that pulls out in such a fun way! The ribbon holds everything in place until the recipient is wants to break in! Not only can you make them in any size you want, but they also won’t break the bank even if you are making a whole bunch! The canvas ribbons are perfect for this project because they are really smooth and slide nicely against the paper. At 3/4″, they are also just the right size to create a substantial bow that is a good proportion to the treat you have tucked inside! Oh, and the mini pompom ribbon – I mean come on…how cute is this stuff! It adds a perfect bit of texture to make the sentiment really stick out. I think I might be a bit obsessed with this ribbon for the Christmas season! There are three of us up today for May Arts/Ribbon Resource that have projects to share with you today! Karen Hanson <——- You are here! 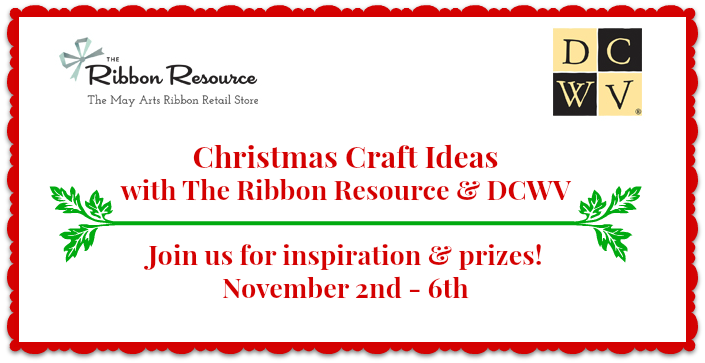 And don’t forget to pop on over to the Ribbon Resource blog as well as over to DCWV’s blog to find out more about this week’s fun and to be entered into the giveaway! Both companies have multiple chances to win, so make sure you get your name in! Thanks for stopping by! This entry was posted in DCWV, General crafts, May Arts Ribbon and tagged candy bar, chocolate bar, DCWV, May Arts, merry memories, ribbon resource, slider by Scrappy Canuck. Bookmark the permalink. They are beautiful and such a great way of giving. Thank you for the inspirations.